The Autumn time is finally here and this means I have gone a little candle crazy. Candles are the easiest way to make your home cosy night in ready and who doesn't love a cosy home all year round but after the colder days and darker nights there's honestly nothing better than coming home lighting a load of amazing candles which fill you're house with amazing sweet pumpkin scents and settling on the sofa with a hot drink and a fuzzy blanket. 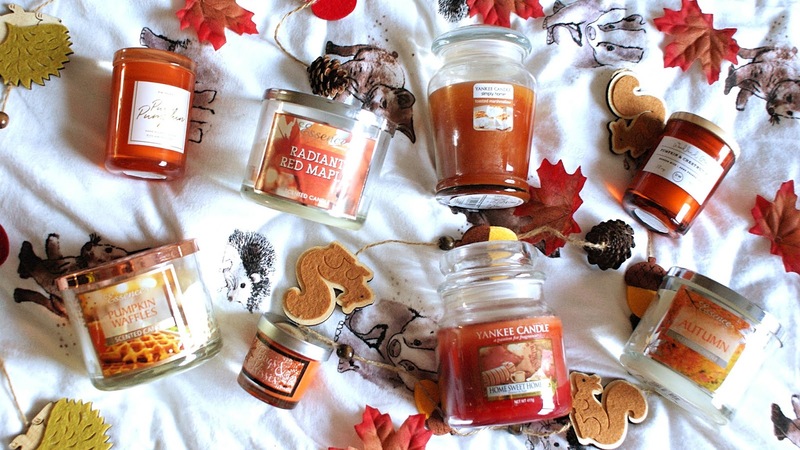 I also find that here in the UK autumn themed candles can be quite difficult to get a hold of as most of the scents are pretty Christmas related. 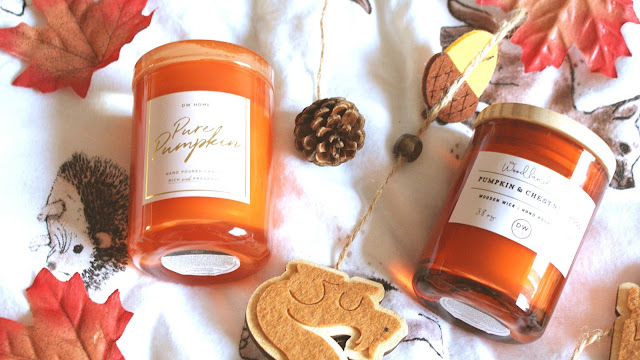 Due to this I thought I would share a few of my autumnal candle faves with you and my go to shops when I want to get my hands on some new candles in the Autumn season. The first place I go when I am hunting for some new candles at this lovely time of year is actually B&M. If you are unsure as what B&M is it is a bargain store here in the UK. This is one of my favourite places to go for candles as they actually have a great variety of both Autumn scents and they have quite a few Halloween ones too which is super fun and as a Halloween obsessive I can definitely appreciate this. 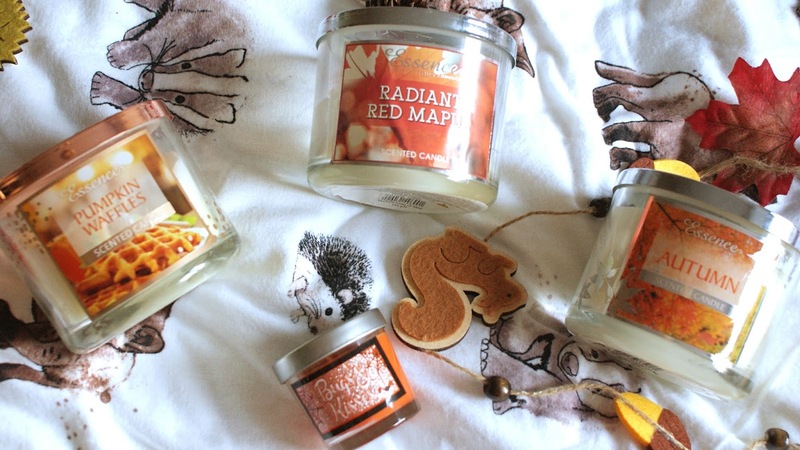 The first candles I want to mention are these three candles from B&M, the brand of them is called Essence and they have a huge range of autumn scents and are so affordable but the three I love the most are Pumpkin Waffles which is an amazing sweet pumpkin scent, 'Autumn' and 'Radiant Red Maple' which are both a crisp scents with a hint of sweetness. These candles have 2 wicks and range between £2.99-£3.99. They burn down really well and fill a room with the scent they are also super cute for photos. These candles are actually dupes for the Bath & Body Works ones which if you are from the UK you probably already know the struggle of getting a hold of those. The other candle I have been loving from B&M is this tiny little one which is called 'Bugs & Kisses' and has a super spicy traditional autumn scent. This candle was literally £1 and is so cute, they have a whole range of these little Halloween candles I got all 4 of them but this one is my fave for sure. The next candles I want to talk about are these two from Yankee Candle. 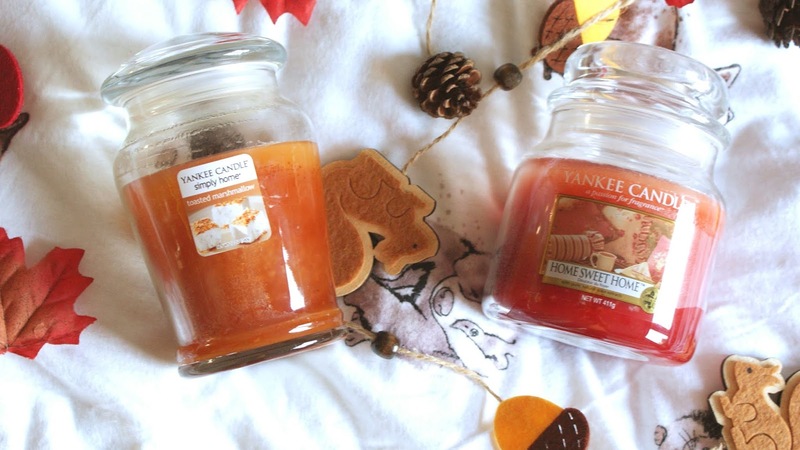 I love Yankee candles so much for the Autumn and Winter time. They are really great candles and really do fill your house with the scents. I get mine either from Asda or my local Yankee store and they can range in prices. I love the 'Home Sweet Home' Yankee candle for this time of year it is such a spicy cosy smell, they describe this as 'A heartwarming blend of cinnamon, baking spices, and a hint of freshly poured tea' and I can understand why it is such a homely scent and I re buy this every year as I just love it so much. This one cost me £16. The other Yankee candle I love for this time of year is one of the Simply Home candles and in the Toasted Marshmallow scent. This is a super sweet scent with a kind of smoky undertone and I again love it also this one was only £9 in Asda which is such a great price for a Yankee candle. The last place I love to go to get myself some new candles is Homesense / TK Maxx. This is hands down my favourite place to get candles for this time of year. 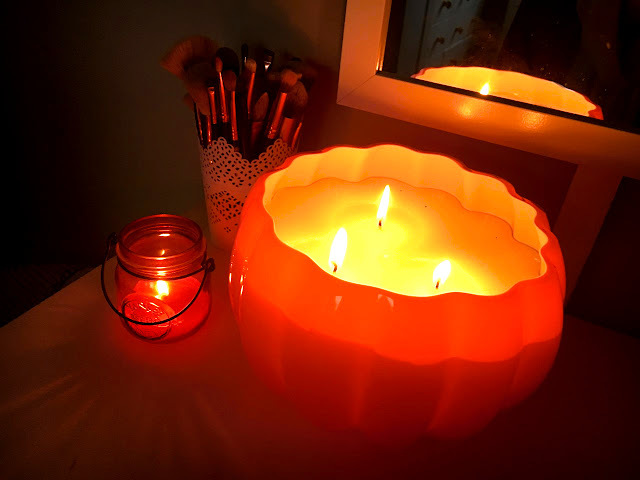 They have sooooo many different autumn and Halloween candles its so good these two little pumpkin candles are so cute and I spoke about them in a recent haul, I actually got one of these for one of my friends who was leaving as a gift as they are just so cute and seasonal. I spoke about these scents in my last Autumn Haul post but they are lovely pumpkin scents. They are both by the brand DW Home and were £3.99 each. The final candle which you can see in the picture below is quite possibly my favourite candle of all time. HONESTLY LOOK AT IT! It is a giant pumpkin and I am not kidding when I say this is giant it is massive. It has a super sweet marshmallow/vanilla scent which smells insane. I also think that this will make a cute bowl once the candle burns down. This one was £12.99 which is really quite crazy when you consider the price I paid for the Yankee candle which is not even a quarter of the size. Anyhow, I hope you enjoyed looking in at a few of my fave candles and maybe it helped you out a little if you were looking for some new candles to spice up your home this season. These sound like they smell amazing! I love TK Maxx for candles and happily have an outlet Yankee Candle store about half an hour drive from me. Candles are 100% one of my favourite things about Autumn/Winter! Definitely need to pop into Yankee Candle soon to give that candle a smell! 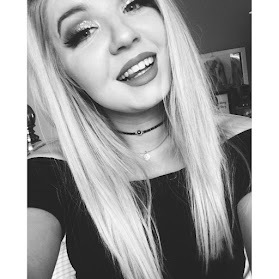 Also absolutely love your falling leaves blog effect - it's so cute!